Field your cosmic clashes on the Crucible in style with the Hypnopotamus Playmat for KeyForge: Age of Ascension! 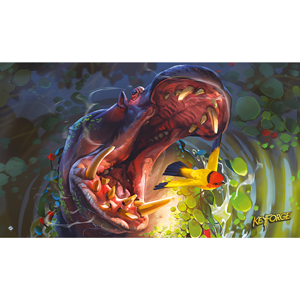 Whether you are playing in a high-caliber tournament or around the kitchen table, this high-quality rubber-based playmat presents your cards in stunning fashion with vibrant art from the world’s first Unique Deck Game. This 24” x 14” mat provides the perfect play surface to protect your cards from stains and spills, keeping the focus on your adventures in the Crucible. Displaying an explosive art piece to display your Untamed pride, this mat keeps your battles organized and immersive.